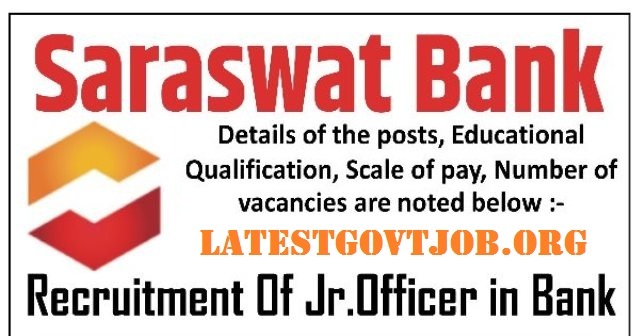 Saraswat Bank Recruitment 2018 For 300 Posts of Junior Officer (Clerk) @www.saraswatbank.com : Saraswat Bank has released a notification for the recruitment of 300 Junior Officers (Clerk). Interested candidates may check the vacancy details and apply online from 23-05-2018 to 04-06-2018. Candidates who have completed B.Com. will be preferable. Selection of candidates will be made on the basis of Computer Based Written Examination and Personal Interview. All candidates have to pay Rs. 600 through online mode using Net-banking/Credit or Debit Card. Interested and eligible candidates may apply online through Saraswat Bank website - http://www.saraswatbank.com/ - from 23-05-2018 to 04-06-2018.